Aren’t they a handsome couple? That’s Rocky on the left (all young and shiny and energetic), and Miss Silvia on the right. She’s not in the first flush of youth, as you can see. Her logo is a bit worn, and she doesn’t have the fancy steam knob and drip tray patterns of these newer models. But inside she’s as strong and well-made as any new machine. She’s seen a few shots and she’s experienced. A few weeks ago, our Krups grinder died. It had been a bit inconsistent and unreliable for a while, and despite careful cleaning and care, it didn’t seem to be improving. It has always introduced a lot of static into the grounds, but recently it had seemed to turn into a fully fledged Van de Graaf generator, so that removing grounds from the hopper was a really messy business. Then it failed completely and we had to think about getting a new grinder. I had been pondering trying to get an espresso machine again. We had a Krups machine some time ago, and while it wasn’t a semi-professional level machine, we enjoyed using it and the coffee it produced. After a few years, the pump failed and we had it repaired, then the pump went again a few years after that, and we couldn’t really justify getting it repaired (fairly expensively) yet again. It was clear that it wasn’t made using good quality, long-lasting components. So we switched to using the Aeropress. I love the Aeropress to bits. I think it’s a great, fun and best of all cheap way to brew really decent coffee. I recommend it to a lot of people, and we’ll certainly continue to use ours when we’re in a rush, on holiday or when making coffee for one in an espresso machine seems like too much trouble. However, it has two drawbacks: it doesn’t make real espresso1, and you need to use roughly double the amount of coffee that you use for espresso. Since we buy fairly decent coffee beans, this was beginning to get a bit expensive. So when the Krups grinder failed, I decided to replace it with a model that was going to be much longer lasting2, and which would also be suitable for making espresso if we decided to get a new machine. 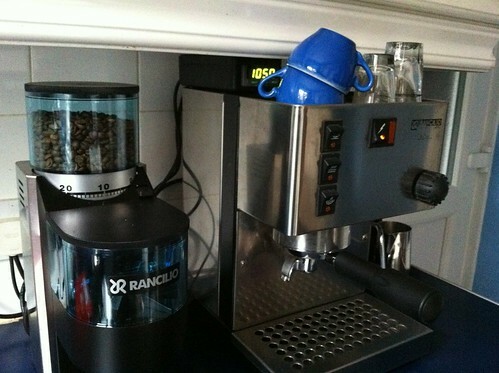 I did some research and the Rancilio Rocky grinder seemed to be one of the best models I could get on my budget. It’s made of solid, heavy components, and is sometimes used in small-scale commercial settings, so it can withstand heavy use. We’ve been really pleased with it, and after the hash our failing Krups made of beans, it’s a bit of a revelation: a fine, consistent grind with no static in the grounds. At the same time, I had ordered an espresso starter pack from Has Bean Coffee, which was wonderful but made me acutely aware of how quickly we were romping through the 250g bags with our Aeropress. When I was doing on research on grinders (and having found out about Rancilio through the Rocky), I came across the Rancilio Silvia (or “Miss Silvia” as many call her3). The Rancilio Silvia espresso machine is a very sturdy unit, made of stainless steel with a brass boiler and other components. It’s a single boiler unit (that is, one boiler provides water for the group head to brew coffee and also the steaming wand), so it isn’t ideal if you mostly drink cappuccinos or lattes (I don’t). However, what you get is a machine with almost commercial-level components in a small, easy to maintain package which is ideal for home use. They have been making the Silvia (with only minor changes to the design) for many years, and as it is a popular model, there is an enormous amount of information available about how to use it, care for it, and how to modify it to improve performance. Most of the reviews and articles agree that the Silvia can be very exacting. You can make excellent espresso, but your technique needs to be good and consistent. While it is bound to lead to a little frustration, I think that’s a great quality in a machine to learn on, because it forces you to understand all the variables involved in making espresso, and how to control them. The articles also agree that one of the most difficult aspects of the Silvia is the rather broad ‘deadband’ in the boiler heating cycle. Rancilio used a fairly cheap thermostat, and in consequence, the water temperature can vary by as much as 10°C while brewing, which makes it difficult to get consistent results. As a consequence, many Silvia owners end up fitting a PID controller, which greatly reduces temperature fluctuations. It also allows you to read the temperature of the top of the boiler continuously, so you have a good idea what the water temperature is at every stage. I was pretty sure that I would want to fit a PID at some point, so I decided to look for a second-hand machine which might already have one fitted. I would be getting the machine at a bargain price (and since the longevity of the machine is good, buying a used one isn’t a problem if it has been well cared for), and I would save the money and hassle of fitting a PID myself. By chance, I saw an advert for just such a machine on one of the coffee forums. It had been posted a while ago, but when I enquired it was still available. After seeing it working (and more importantly, drinking a coffee made with it), I bought the machine last weekend, and have been having an enormous amount of fun with it ever since. On the first day, I drank too much coffee. Far too much coffee. I was engrossed in trying out the machine, tweaking the grind and the dosing and tamping and before I knew it, I had gone a bit over the top. At some point, I wondered why the world was jiggling around, and then realised that it was actually me. Perhaps I had drunk enough coffee for the day. It is addictive though: not just the coffee itself, but also the experimentation and the pursuit of the perfect espresso. I know that some people think making espresso is too much of a hassle, but I’m really enjoying it. Even on the days when I’m rushing to get to work, I like the meditative aspects to the routine of turning on and warming the machine, grinding the coffee and evening the dose, then tamping and pulling the shot. I’m a geek and a scientist and I love measuring and tweaking and trying different things out. The Silvia is a pleasure to use in this respect. It’s solid and heavy, and you get that indefinable satisfaction to be found in using well-made things. Anyway, I’m really pleased with Miss Silvia and her partner Rocky. I’m learning all the time, and enjoying some really great coffee, which is the ultimate point of the exercise. In time I hope to be on first name terms with Miss Silvia, but I’m not quite there yet.